Looking for a delicious quick bread recipe? 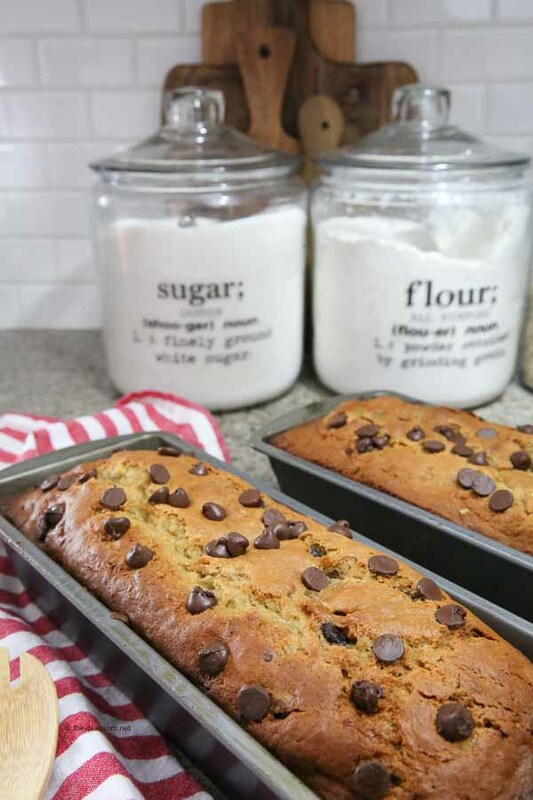 This peanut butter banana bread recipe is filled with peanut butter goodness and chocolate chips. Great for a snack or a quick breakfast on the go. 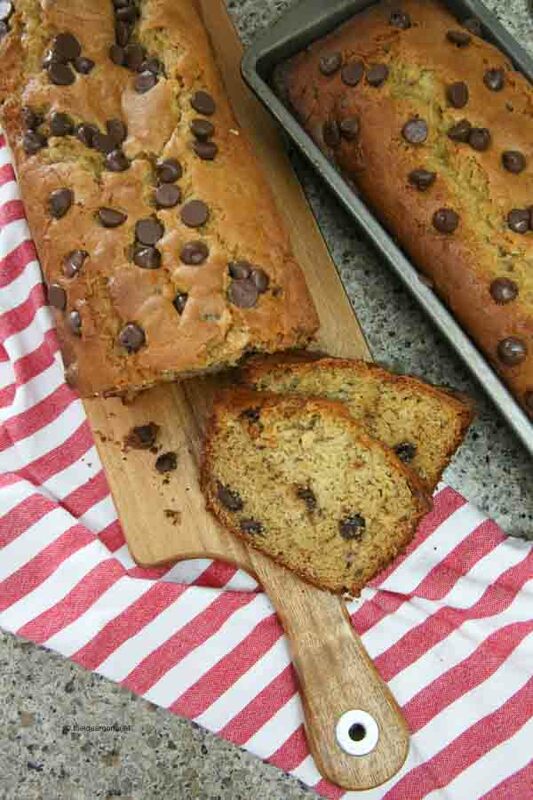 One of our very favorite quick bread recipes is Chocolate Chip Banana Bread. 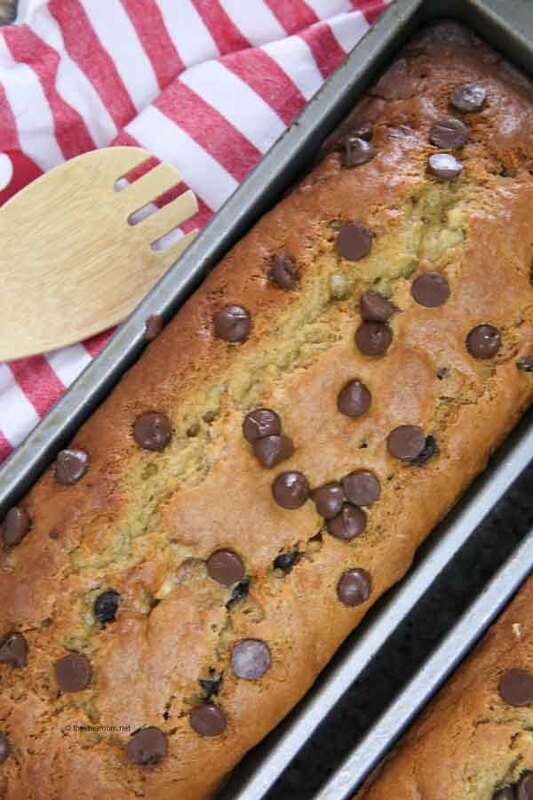 Peanut Butter Banana Bread with some chocolate chips thrown in because everything is a little better with chocolate. I love making Quick Breads because they are so easy to make and can be ready to eat usually in one hour! There is nothing better than a delicious, warm piece of bread right out of the oven. Quick breads are traditionally easier to make than yeast breads, but there are a few tips and tricks to making sure your quick bread recipes turn out great every time you bake them. Avoid over-mixing the batter. Stir the wet ingredients together well and then mix in the dry ingredients so that the batter is lumpy. Over-mixing will produce a tougher bread. Quick Breads with nuts actually taste better the day after baking. So wrap up the loaf of bread in plastic and store overnight before slicing and serving. Check your quick breads 15 minutes before the baking time is up. If the bread is browning too much on the top, cover the top with foil to prevent the bread from burning and drying out. Test the loaf with a toothpick in the center of the bread. If it comes out clean the bread is finished baking. If your bread has a crack along the top of it, that is actually a good thing. It means that your bread batter has expanded properly. Now some of you might be interested in a Peanut Butter Bread Recipe. 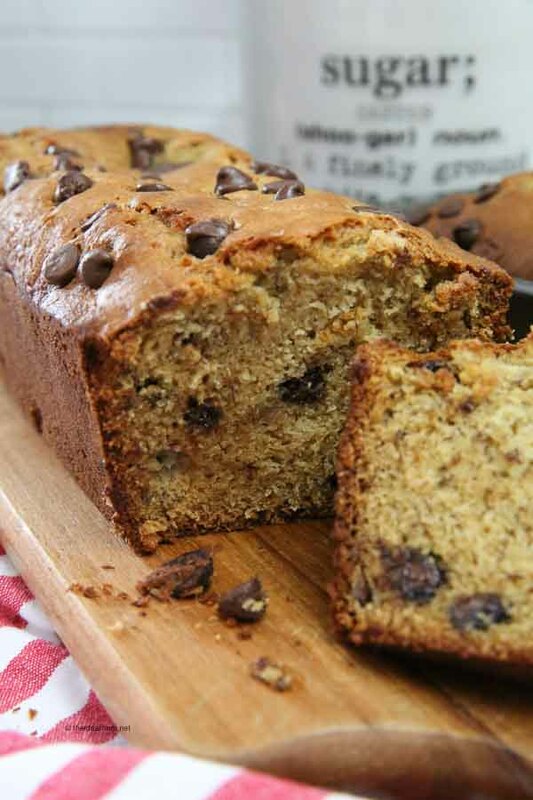 This recipe makes a perfect peanut butter bread, if you simply leave out the chocolate chips. And on that same note, quick breads make it pretty easy to throw in some of your favorite add-ins. Some of our favorites are nuts, cranberries, raisins, peanut butter chips, butterscotch chips and berries. So get creative and change it up from time to time and you might find a combination that you absolutely love! 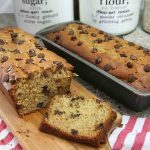 This banana peanut butter bread recipe is filled with peanut butter goodness and chocolate chips. 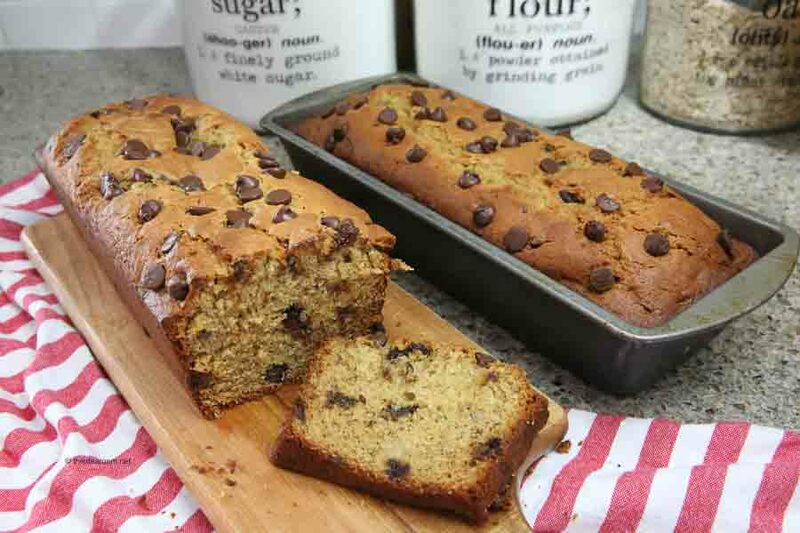 This quick bread recipe is the perfect solution to using your over-ripe bananas. Preheat oven to 350 degrees F. Grease two (2) 9×5-inch loaf pans. In a large bowl, cream butter, peanut butter, and sugar until light and fluffy. Add eggs, one at a time, beating well after each addition. 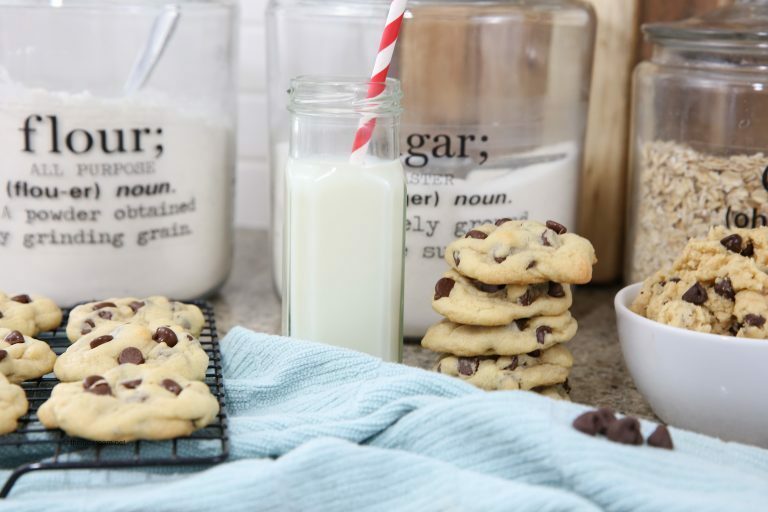 Sift in flour, baking powder, baking soda, and salt; stir until dry ingredients are moistened. Fold in bananas. 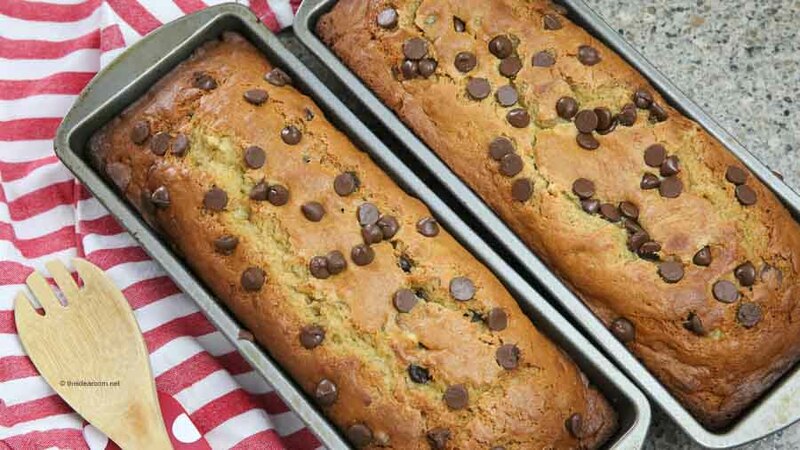 Gently fold the remaining chocolate chips into the banana bread batter. Pour the batter into the prepared bread pans filling about 3/4 full. Sprinkle the top of the loaves with the reserved 1/4 cup chocolate chips. Quick breads should be placed in the center of the oven to cook evenly. When testing to see if the bread is cooked insert a toothpick into the center of the loaf. Nutrition information via MyFitnessPal. Just made this today :) I have NEVER had a bread bake up so beautifully. It rose well above the pan and is stunning. It would be so pretty to gift – but I am sure my kids will eat it up long before we could have a chance to share! Thank you so much! SHondel- I am so happy to hear this! It’s a family favorite. Thank you Shondel! I am so glad you loved it! It’s a favorite around here too! This is a great recipe for breakfast. I loved it, it seems easy to do. Raissa- It is so simple to make! Hope you enjoy it. I am making this bread right now, but am somewhat confused as the directions say to stir in the ingredients and I just watched the video and used my mixer. So far it has been in for 60 min and still gooey in the middle so I am hoping I did not mess up. Which way is better in your book Mixer or stirring by hand? Also had regular 9 x5 pans and am really hoping it turns out okay. Thank you. Gail- Mixing by hand is great too. Either works great. I hope it ended turning out well.